A compact, electronic handheld tester has been developed that is suitable for measuring cooking oil used for frying on a daily basis. As good as gold when it comes to saving cooking oil! The cooking oil has a direct influence not only on the quality of the fried goods, but also on the costs. Old oil has a negative effect on the taste of the food. If the oil is changed too soon, unnecessary costs are incurred! For this reason, the cooking oil must be used optimally. Reliably determining the optimum time to change the oil is very easy. With the model 270, you ensure that the oil is used efficiently. This helps you save cash by saving costly cooking oil. 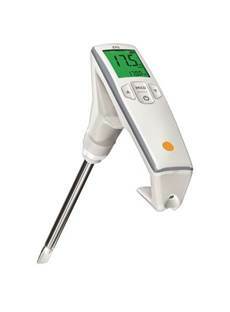 With the model 270, you provide your customers fried foods with a maximum of flavour. In addition, you have no problems complying with legal requirements. ... it is easy to clean, has a robust sensor, is easy to operate, provides you with a reliable and secure result and a traffic-light display system provides oil status at a glance. Green display indicates TPM content is good. Amberdisplay indicates TPM value will need changing soon Red display indicates TPM value has exceeded safe amount. Battery life approx. 25 h cont. oper. Securing Product Quality & Savings from correct consumption of Oil.